then sucked back separating the water from the rubbish, and pumped back into the sea. shared, making everything more efficient, and everyone happier. why you should… One of such is that all backers will be invited to the launch of the Seabin they funded. This is open to everyone, from individuals to businesses, we all need to band together to clean our seas. Thank you, your contribution means the world to us. The Seabin can catch an estimated 1.5 Kgs of floating debris per day (depending on weather and debris volumes) including microplastics up to 2 mm small. 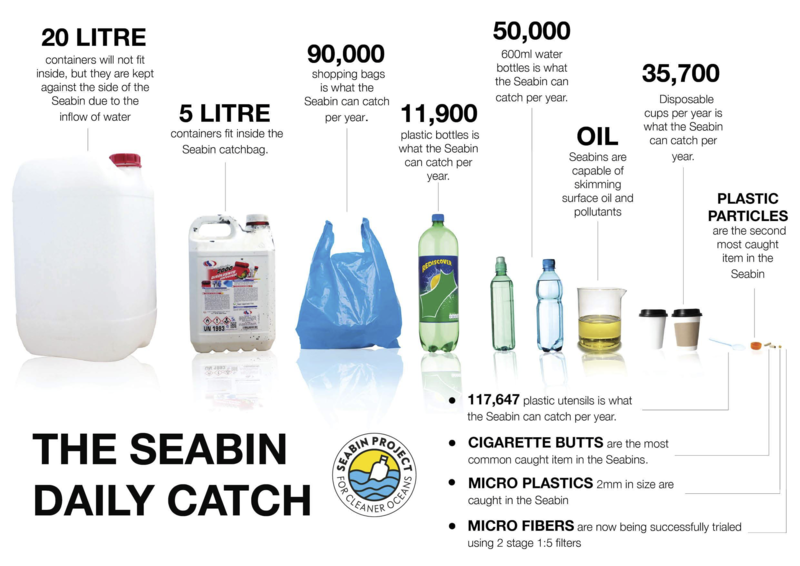 Over an entire year, that amounts to roughly 1/2 a ton per Seabin. Locally, we have seen a higher rate thus far. Water is sucked in from the surface and passes through a catch bag in side the Seabin, with a submersible water pump capable of displacing 25.000 Lph (liters per hour), plugged directly into 110/220 V outlet. The water is then pumped back into the marina leaving litter and debris trapped in the catch bag. How to maintain the Seabin? The catch bag can hold up to 20 Kgs of debris and it is advised to be checked daily and emptied as needed. The Seabin needs to be cleaned at least once per month. Local councils will handle the maintenance of the Seabin. Each contributor will be invited to the launch of the Seabin in their funded area and have their name or organisation on the contributor list.